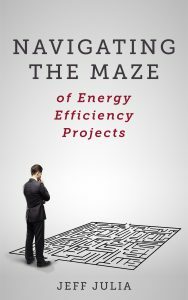 Jeff Julia: Subject matter expert, engineer and award winning author, answers 6 questions about the inspiration behind his new release “Navigating the Maze: of Energy Efficient Projects” is a guide to energy efficiency. Jeff is the founder of Energy Project Advisors that serves as an objective advisory firm assessing the integrity and validity of energy saving projects for your home or business. Jeff: “I have met many individuals who did not understand or trust the energy efficiency audits and proposals they were shown. This book is the result of countless hours of learning, strategizing, writing, revising, proofreading, designing and publishing. I understand that energy efficiency is outside of most business professionals’ expertise, leaving them in the situation where they could be taken advantage of, so I decided that I wanted to change this. The marketplace is glutted with energy saving products and proposals resulting in confusion and skepticism across the board.